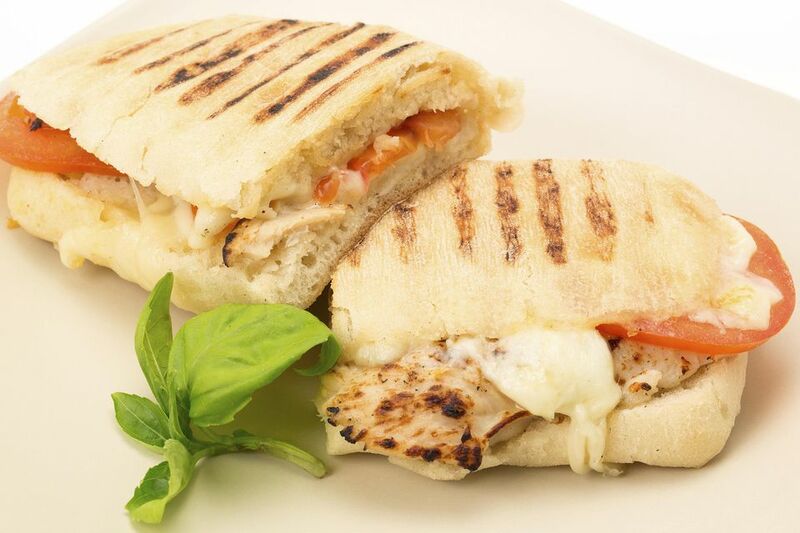 This is a delicious grilled chicken panini recipe that is fast and easy to make. You will use boneless, skinless chicken breasts for lean protein that is well-seasoned and scented with rosemary and garlic. The chicken breasts can be grilled ahead of time and then used to make slices for sandwiches for the next couple of days. As well, the grilled chicken can also be added to salads for another quick and healthy dinner or lunch. As for the sandwich itself, you may have a panini maker or George Foreman grill that you like to use. But you can also use the old-school method and press it right there on your gas or charcoal grill. While you could simply grill it without pressing it, for a real panini feel you need a weight. There are cast iron tools such as a grill press or bacon press that work well for this, sitting on top of the sandwich. But an equally effective tool is a clean brick wrapped in a couple of layers of aluminum foil. You will need oven mitts to manipulate the hot weight or brick. Lightly oil the grill grates. Place the chicken on the grill and cook for 7 minutes per side or until juices run clear and chicken is no longer pink. Remove the chicken from the grill. Allow it to cool for 5 to 10 minutes. Cut it into 1/2-inch slices. Drizzle Italian dressing on 4 slices of bread and on chicken pieces. Add tomato and cheese and sliced chicken breasts to the bread. Over medium heat, place the sandwiches on the grill. Place the weight on top of the sandwich and cook the panini for 4 minutes. Remove the weight, turn the sandwiches over, and replace the weight. Cook for 4 minutes on this side, or until the cheese melts. Remove from heat and serve with your favorite side of antipasto salad, potato salad, macaroni salad, chips, or pickle. With this basic recipe, you can add or substitute any of the ingredients to suit your needs.. Mozzarella is a good choice for cheese as it generally stays inside the sandwich rather than dripping down into your grill. Swiss cheese is another choice that will be less gooey. But you could choose a more flavorful cheese if you prefer. Try substituting pesto for the Italian dressing.